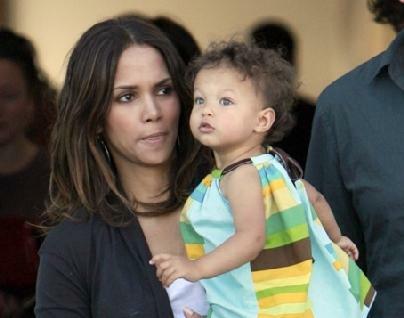 *Halle Berry says she would consider giving up her acting career to focus 100 percent of her attention on raising her daughter. The Oscar-winning actress explained that becoming a mother to 2-year-old Nahla – her child with ex-boyfriend Gabriel Aubry – has made her a “better person” and shown her that an illustrious film career is not something she necessarily needs. “Children shift your priorities and now I have a greater purpose for being here,” she told The Mirror. “I love making movies but I would give it all up to be with my daughter if I had to because she’s the love of my life. The star of “Frankie and Alice” also assured the publication that she has not become jaded by her failed romance with Aubry, but accepted that perhaps she would rather be a mother than a wife. Nahla is a cutiepie!!. I hope Halle ahs another occupation on hand or has saved up alot of money because Nahal needs to have the basics just like any other child. Yeah I believe age was creeping on her and she compromised to have that cute lil girl. Unfortunately many women Hollywood or not compromise like that due to age. I dont understand that one! Haaaaayil “give it up” for….MANKIND!!! P.S…And ..”yes”!, she’s a damn lie!! Haley is not a good actress and the movies she plays in are box office flops.